Where are the dairy checkoff reports to Congress? The fluid milk and dairy checkoff programs are required by law each year to submit a Report to Congress. But these reports have gone missing since 2012. Under the federal government's authority, the public-private checkoff programs collect several hundred million dollars each year in mandatory assessments from dairy producers, to be used for industry projects and marketing initiatives such as "milk mustache" posters, "Got Milk" ads, Domino's and Pizza Hut marketing partnerships, and other fast food industry collaborations. The USDA reports play a key role in transparency for these federal programs. The most recent report on USDA's website is the 2013 report covering the 2012 checkoff activities and budgets. When the annual reports stopped appearing, I assumed USDA had simply delayed sharing them on the website. This blog first pointed out their absence in 2015, more than two years ago. Finally, in answer to my Freedom of Information Act (FOIA) request this summer, USDA told me in July that it would not share any documents, because the department had never published the reports or submitted them to Congress as required. This morning, the lead story by Catherine Boudreau for Politico's Morning Agriculture covers this issue. The Agriculture Department hasn't published legally required annual financial reports on a $400 million dairy research and promotional fund for the past four years, lending ammunition to farmers and other groups pushing for more transparency in checkoff programs. A USDA spokeswoman told POLITICO the reports on the dairy checkoff are in the final clearance stage and should be posted within the month. The 2016 report is still in the works, she added. But the agency declined to explain the yearslong delay. In July, USDA turned down a Freedom of Information Act request for the documents from a Tufts University professor, saying that it had no records to send because the reports hadn't been published. One of the best things about the annual reports, when they were still being published, was the independent evaluations by leading agricultural economists such as Harry Kaiser at Cornell and Oral Capps and Gary Williams at Texas A & M. At the 2016 annual meeting for AAEA, Kaiser and I organized a lively discussion of checkoff programs and nutrition. The Organization for Competitive Markets (OCM), which advocates for reform of checkoff programs, also wrote about this today. The OCM points out that former Secretary of Agriculture Tom Vilsack now is the CEO of the checkoff-funded U.S. Dairy Export Council. I share the view of others quoted in the Politico article, suggesting that Congress should strengthen oversight over these programs and make both their finances and activities more transparent. USDA reported today that the rate of household food insecurity fell during the economic recovery of the last five years of the Obama administration, from 14.9% in 2011 to 12.3% in 2016. The annual statistics are based on a national household survey each December, which asks about 18 different experiences related to food security during the year. The new statistics represent modest improvements after a period of exceptionally high food insecurity in the United States. 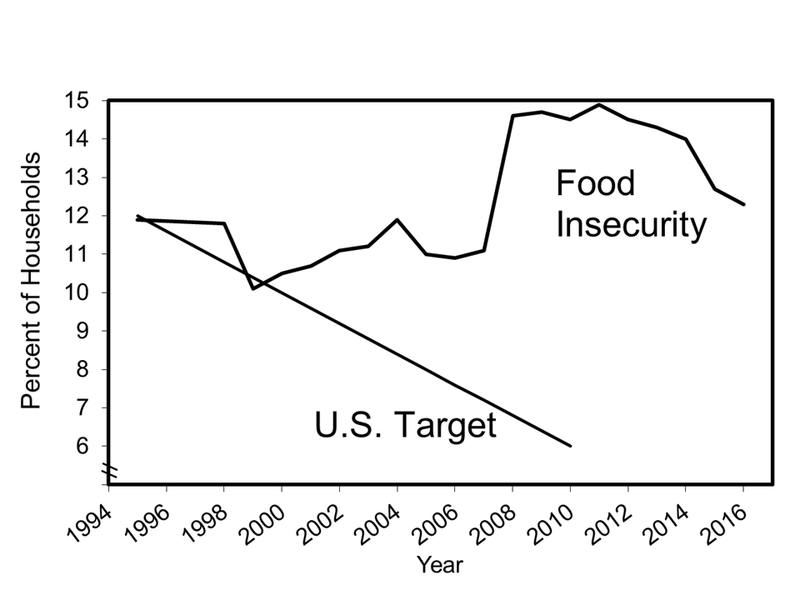 From the time the survey measurement began in the mid-1990s until the mid-2000s, the rate of household food insecurity never exceeded 12% [typo corrected, 4pm]. Then, during the Great Recession, in the last year of the W. Bush administration, this leading measure of food-related hardship jumped from 11.1% in 2007 to 14.6% in 2008, the largest ever single-year increase. Although it is sometimes said that USDA no longer measures "hunger," one of the 18 survey items is a direct question asking survey respondents whether they went hungry during the year: The statistical supplement to the new USDA report shows that 4.0% of household respondents reported being hungry in 2016. 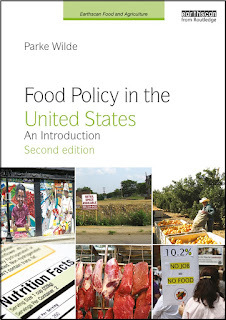 In the late 1990s, the United States and many other countries adopted goals for cutting food insecurity and hunger by half. 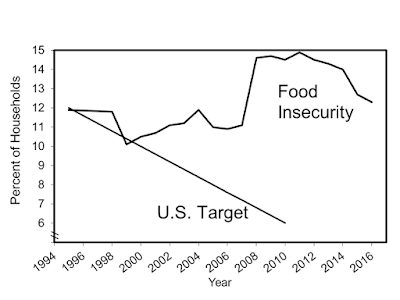 Yet, the rate of food insecurity is higher now than it was at the time those goals were set. In the longer term, there has been no national progress toward reducing food insecurity and hunger. A bi-partisan National Commission on Hunger in late 2015 made a series of sensible recommendations for reducing U.S. hunger. The report includes several compromises on themes that are likely to appeal to Republicans and Democrats alike, including protecting the Supplemental Nutrition Assistance Program (SNAP) from deep cuts, promoting dietary quality, and supporting work for program participants. At Brookings, the economist Jim Ziliak has recommended an agenda for modernizing SNAP (.pdf) that includes a benefit increase. Yet, as Congress takes up the next Farm Bill, which will reauthorize SNAP, there is serious concern that leadership in both the House and Senate will support a more punitive approach with a focus on budget reduction at the expense of the poorest Americans. If that happens, it is easy to imagine that rates of household food insecurity could reverse course, end their recent brief turn toward national goals, and climb once more. In my view, Americans of all political persuasions, Democrat and Republican, whether oriented primarily toward the social safety net or toward market-based solutions, should express high ambitions for reducing food insecurity and hunger in the United States.